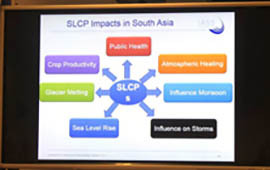 Air pollution is a major environmental and health concern in South Asia. Every year it is responsible for over a million premature deaths as well as significant crop losses. Certain air pollutants also contribute to regional climate change, affecting the monsoon circulation and rainfall, as well as melting glaciers of the Himalayas. South Asia is rapidly urbanizing, with fast growing emissions.In order to facilitate the creation of science-based policies to be implemented on the ground based on local specifics, the Institute of Advanced Sustainability Studies (IASS), International Centre for Integrated Mountain Development (ICIMOD), German Federal Environmental Agency (UBA), the Government of the Maldives, and the Climate and Clean Air Coalition (CCAC) jointly organized a side event titled ‘Short-Lived Climate Pollutants (SLCPs) in South Asia: Current Scientific knowledge and ways forward to develop tailored policy recommendations’ during the UNFCCC’s COP19 in Warsaw, Poland, on 18 November 2013. 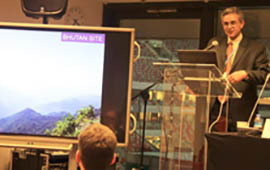 Dr Mark Lawrence, Scientific Director at IASS, explained that reducing short-lived climate-forcing pollutants in the Himalayan region would benefit all the people dependent on the Himalayas for water, food, and hydropower. Also speaking at the event, Dr Arnico Panday, Programme Coordinator Atmosphere Initiative of ICIMOD, said addressing air pollution requires more than local efforts, as the source of pollution could be faraway. 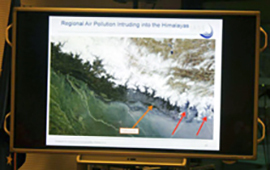 In the context of Kathmandu valley, in addition to knowing what fraction of air pollution is locally emitted, and can be controlled locally, the fraction contributed by surrounding hills and valleys, from southern Nepal and from further away in the Indo-Gangetic Plains, should also be determined. “Similarly, it is important to know the fractional contribution of different pollutants and processes to the melting of the Himalayas,” said Dr Arnico Panday. 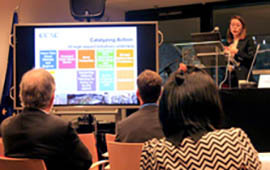 He gave an overview of ICIMOD’s Atmosphere Initiative, and the activities in science, mitigation, and policy planned for the 2014-2017 period. Sophie Bonnard of CCAC, Ali Shareef from the Ministry of Environment and Energy of the Maldives, and Marion Wichmann-Fiebig from the UBA also spoke at the programme. The event was moderated by Dr Birgit Lode and Dr Maheswar Rupakheti from IASS.